Its Christmas Eve and its been a little different for me this year. 80 degree temperatures do not make it feel like Christmas. My house is usually covered in various decorations and today I sit in a very nice yet bland rented villa. So in some ways it does not feel like Christmas. One thing that is similar are the shops. They are packed morning, noon and night. You would not believe there is a credit crunch! Today we are going to Aquatica and Sea World sandwiching a trip to Discovery Church for their Christmas Eve services. It will be good to take time out to remember what Christmas is all about. At MKCC we have just finished our series based on U2 songs so I was interested to read the following quote from Bono over at The Resurgence. 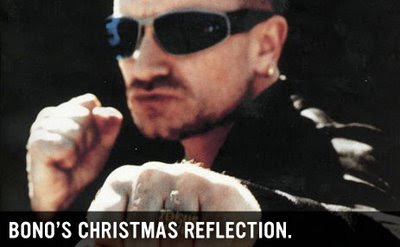 "On Christmas Eve Bono went to the famous St. Patrick’s Cathedral, where Jonathan Swift was once dean. Apparently he was given a really poor seat, one obstructed by a pillar, making it even more difficult for him to keep his eyes open…but it was there that the Christmas story struck him like never before."